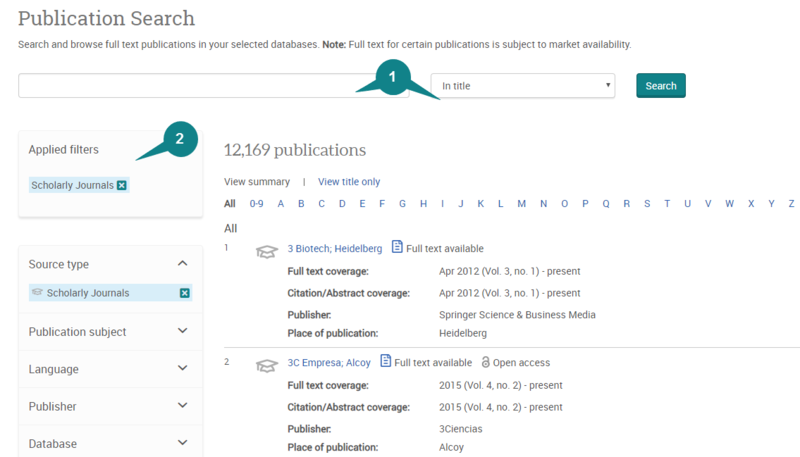 The Publication Search page lists all publications in all currently selected databases. If you select multiple databases, only the publications with full-text display. You can search for one or more publications. Your search will return matches on both current publication titles and their as-available historical titles. 1. Search for a Publication using the pull-down menu to choose to search In the title, Title begins with, In publication summary, and In subject. Boolean operators and the truncation (*) and wildcard (?) characters are supported. Visit the Search Tips Help to learn more about successful searching. 2. To narrow your publication list, use the filters in the left column to refresh your list to target specific types of publications based on focus or content. Expand and collapse filter categories such as Source type, Publication subject, Language, Publisher, and Database. 3. 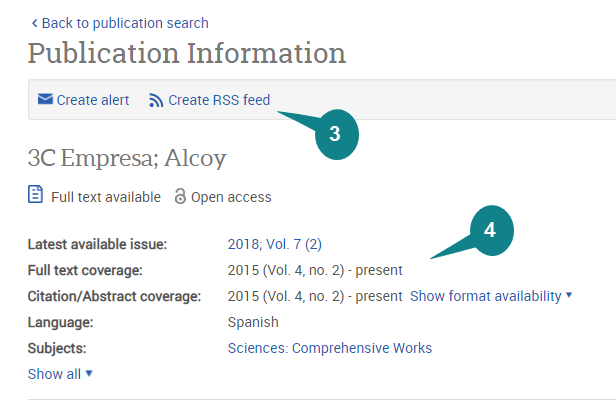 The Create Alert and Create RSS Feed option from the Publication Information page sets up a table of contents notice that will let you know when a new issue of the publication is loaded into ProQuest. For additional help setting up the alerts, visit our Publication Search help page here. 4. From the publication results page, select a publication title to view the Publication Information.The record includes the Publication title, Coverage, ISSN, Language, Subjects, Source Type, Publication title history and Publisher information which includes Publisher name and address. As a general rule, ProQuest only has an entry for the last title of a journal, and its ex-titles appear in the title history field of the publication record. 5. From the publication information record, use the Search within this publication to search and locate articles containing your search terms. Selecting the Advanced Search link will open up the Advanced Search page and populate the search form with the selected publication title and the publication title field from the Advanced Search pull-down menu. Visit the Advanced Search Help page to learn more. 6. 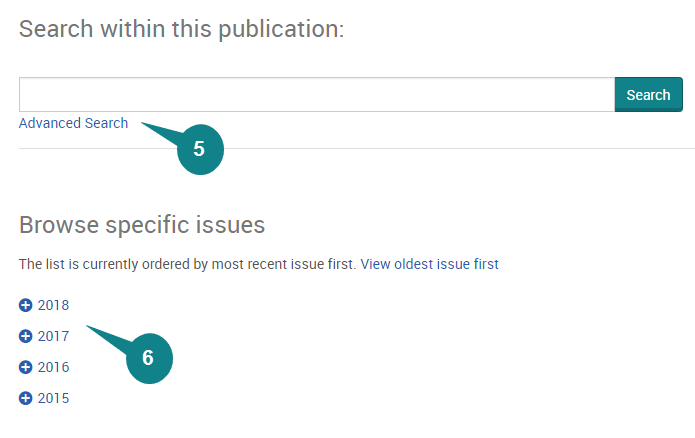 From the publication information record you can also browse the available issues by selecting a year and then an issue to view the published articles within that issue. The list of issues are sorted by most recent issue first, but you can also choose to sort by the oldest issue first.